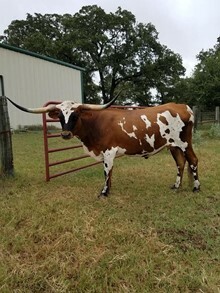 BC Bowl is a beautiful red & white paint cow with pretty horns. She always has a majestic look about her and is one of the first to be complimented when visitors stop by the ranch. She takes the most beautiful pictures, especially with her calves! 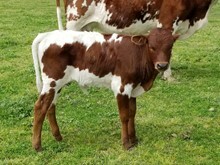 She had a beautiful bull calf on 01/07/19, the Sire is AWESOME COWBOY! 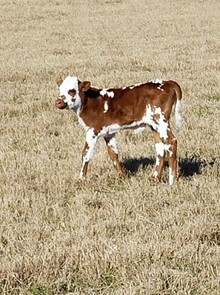 BC BOWL is not for sale but she has a beautiful bull calf, that is. She also has several offspring that have reached high 70s & 80 inches TTT! 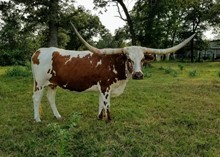 BC Bowl is a beautiful red & white paint cow with pretty horns. 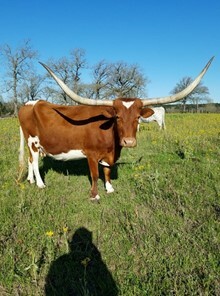 She always has a majestic look about her and is one of the first to be complimented when visitors stop by the ranch. She takes the most beautiful pictures, especially with her calves! Bowl is confirmed pregnant by blood draw, 10/22/18.